Oh-so-tempting itsy bits! 56% cacao. Made from rich cocoa and golden cane sugar, without any additives or emulsifiers. The result is rich chocolatey goodness! Ingredients: Cane sugar*, cacao mass*, cacao butter*. *FAIRTRADE CERTIFIED. May contain traces of nuts, peanuts, soy, dairy products and wheat. These were okay. For an organic product, I didn't think they were as good as some others that I have tried. Mediocre. Super delicious, this is my go-to baking chocolate and little chocolate fix. It's so hard to find dairy-free semi-sweet chips! and they are school friendly. Taste the same! a little pricey so i buy in large quantities when on sale. I love these and have been using them for years. They're the best organic chips I've found. Amazing! My husband and I ate a couple of these and then ate a couple of regular chocolate chips and were totally grossed out by the regular ones! You know a product is good when it makes the unhealthy ones seem very unappealing! Best company, best chocolate, love it ! Excellent! I put them in pumpkin muffins and banana bread and my very picky sons devoured them. I will definitely be buying these chocolate chips again and again! Lovely smooth texture and good flavour. 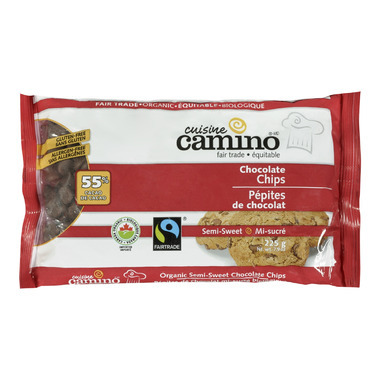 These were OK. A little too bitter for me (I used them in some chocolate chip cookies) and I feel they were a little pricey considering I didn't enjoy them that much. Puts me off trying any other Camino chocolate products. Yummy! I'm now not feeling so guilty feeding chocolate chip pancakes to my family on saturday mornings!